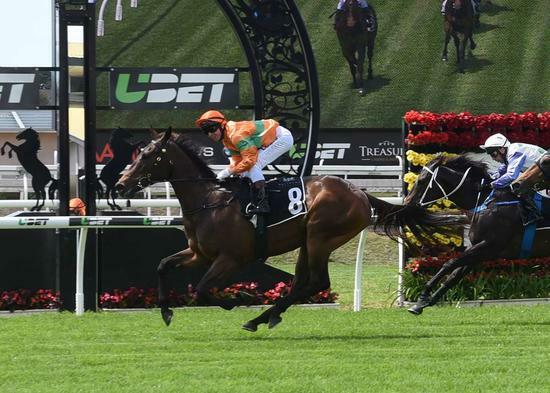 Promising filly Dream Kisses gave her supporters a few anxious moments before confirming Magic Millions Classic plans with a dominant victory at Eagle Farm on Saturday. Dream Kisses, ridden by Paul Hammersley, was forced back near last after a tardy start before powering home for a 1-1/4 length win over Tiara Star in the QTIS Two-Year-Old Handicap (1000m). Acceptile was relegated to third after Tiara Star's rider Jeff Llloyd protested successfully. Dream Kisses was one of only two runners in the small field with race experience after finishing second on debut behind the Liam Birchley-trained Real Princess at Doomben a fortnight ago. The daughter of Dream Ahead was a bargain buy at only $2,000 at the Magic Millions sales and is a daughter of the former well performed mare Kiss Me Katy. Like Dream Kisses, Kiss Me Katy was trained by Steve O’Dea and was a Listed race winner and Group 3 placegetter in the San Domenico Stakes in Sydney in 2009 in a shortened career of 11 starts for four wins. Kiss Me Katy was bred by her owner, Burdekin cane farmer George Rapisarda who has had a long association with O’Dea. “Kiss Me Katy was my first ever winner in Brisbane and put me on the map down here,” O’Dea said. O’Dea said there was plenty of upside to Dream Kisses who had to overcome a skirmish in the straight when early leader Acceptile veered out sharply. “It was good to see her put them away like that,” O’Dea said. “She got back in behind them and travelled a lot stronger on the bridle and was a bit more tractable. “The other day when she drew a bad gate we had to use her a little bit more than expected. O’Dea has had only one starter in the Magic Millions Classic when Candika finished third to the Peter and Paul Snowden-trained Capitalist in January. “She’s qualified now for the Magic Millions and more than likely she’ll have a little let-up and have a run or two going into the Magic Millions,” he said.